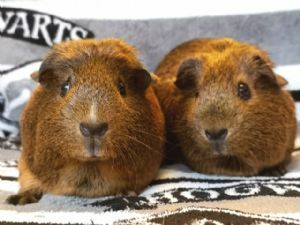 Addison and Arizona are two beautiful female agouti guinea pigs. They came into our care following a large intake of pigs from a property where mis-sexed piggies had led to lots of unwanted pregnancies, leaving the owners unable to cope. We guesstimate them to be around 12/18 months of age. They would make good additions to a family with older, sensible children. The girls can be a little skittish but fine once happily settled on your knee with food! We recommend an indoor C&C set up for all our piggies as they provide lots of space and are cheaper than store bought cages (see our housing guide for more info: http://www.manchesterandsalfordrspca.org.uk/wp-content/uploads/2019/02/Guineapigguide2019-Housing.pdf ). Min. size housing for two guinea pigs is 5x2ft but bigger is better! Please call 0161 882 0680 option 4 to meet the girls!